This paper was presented at the Science of Whole Person Healing Conference on March 28, 2003. The purpose was to show that humans do have interaction with and effects on matter. This report captures the results of 22 years of research with experiments in psychokinesis (PK). The author began the PK Party workshops as an experiment to test his hypothesis that significant paranormal effects would be produced if a large peak emotional event could be orchestrated. It worked so well in the first PK Party (January 1981) that he has continued to conduct theses workshops. There have been 361 PK Parties (17,000 attendees) conducted by the author, and many more by others all over the world. Often controlled experiments have been conducted within the PK Party environment, some that are reported in this paper. ESP activities are passive and PK activities are active. The first 10 years of my research were in applications of the mind concentrated on remote viewing. The last 20 years have been concentrated on material deformation through PK. I continue collecting data while giving workshops teaching people how to do both RV and PK. In the early 1970's, I became interested in how people could do remote viewing (RV). The term remote viewing was coined by Hal Puthoff and Russell Targ who were with Stanford Research Institute (SRI) International developing the technology to understand and apply RV. (Reference 1) The RV phenomenon is that a person in one place can somehow send their "mind" out to another place and "see" what is happening at that location. Later SRI and other research laboratories realized that the data came to the viewer in all the body senses, not just visual. The other laboratories began calling this remote perception. Although I am an aerospace engineer, most of my spare time has been spent reading about phenomena that related to seeing-at-a-distance (e.g., out-of-body experiences, astral travel, near-death experiences). In my professional career at McDonnell Douglas, I managed an advanced research group with some Government contracts that provided some access to background data during 1970 through 1990. Mr. James McDonnell was very interested in similar phenomena and was providing some funding to parapsychology laboratories. He heard about my interests in 1980 and funded a coordinate remote viewing experiment (i.e., an experiment where the viewer is asked to see what is located at a target given by latitude and longitude coordinates in degrees, minutes, and seconds that is about 100-foot resolution). While documenting that experiment, I wrote a chapter on a conceptual model in an attempt to explain how remote viewing might work (Reference 2). 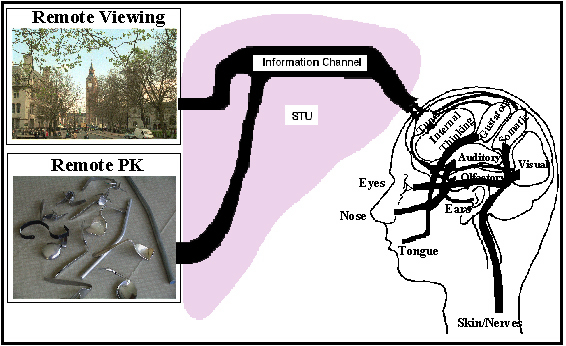 The conceptual model for thinking about how an individual can send their mind out to do remote viewing and PK is illustrated in Figure 1 and described in more detail in Reference 2. The area labeled STU is a representation of the mind passing into another dimension where all information is stored, similar to Jung's collective unconscious and the metaphysics term "akashic records." The acronym STU stands for Space Time Unit. In remote viewing experiments, it is observed that the data a viewer produces often was correct about the target location, but not how that target location looked at the time the Conceptual Model of the brain and mind interacting with remote objects and scenes. viewing took place. I call this a "time-shift." It appears as if the mind of the viewer goes to the correct target and locks onto a time when there was a peak emotional event occurring at that target. Thus the data that the viewer reports may be years before the time of the viewing, or even sometime in the future. Of course this makes evaluating the success of an experiment difficult. Figure 4 in Reference 2 attempts to show this time-shift effect. In talks presenting my Conceptual Model, I suggested that in order to minimize this time-shift effect, create a peak emotional event at the current time and some major paranormal event (e.g., psychokinesis) might occur. Parapsychologist Charles Honorton challenged me to test my model. In January 1981, in response to this challenge, I conducted an experiment that I called a PK Party. PK stands for Psychokinesis, (which, as noted previously, is defined as mind-over-matter) and the idea of a party was to make it a wild emotional event (allowed in California). There were 21 people at the first PK Party in my home in Huntington Beach, California. Half of these people were participants in my RV experiments and the other half were members of the same tennis club I belonged to. Everyone was told that we were going to bend metal with our minds. The tennis players thought this was a big joke and the RVers thought they had God-given powers to perform perception type activities, but not PK activities. Fortunately, I had met a metallurgist named Severin Dahlen at work who was teaching children to perform PK at the University of California, Irvine. I invited Severin to come to the party and give the instructions. In preparation for this event, I had stopped at the Sears store and purchased a large zinc coated steel rod thinking that if it was bent, I would be impressed. I also provided my grandparents' sterling silverware for bending material. "Get a point of concentration above your head. Grab it and bring it down through your head, your neck, your shoulder, down your arm, into your hand and put it into the fork or spoon." "Command the silverware to bend by shouting BEND, three times." After these instructions, a minute or two went by and a 14-year-old boy began screaming that his fork was bending. Everyone could clearly see that the head of his fork was bending over slowly. I noticed that everyone's eyes were huge and I now call that "an instant belief system change." Shortly after that, almost everyone began bending his or her silverware very easily. They were jumping up and down, shouting, and screaming. This was a peak emotional event! They described the silverware getting warm or sticky, with the metal becoming very soft, like rubber, for five to 30 seconds. 19 of the 21 attendees at the first PK Party were able to do what I now refer to as "Kindergarten bending." One of the participants was a woman who had told a friend of hers before the party that she didn't see any sense bending silverware. Unfortunately, she created a mental block for herself. She came to subsequent PK Parties and finally was able to bend metal at the fourth party. I was the other person who did not bend at the first PK Party. I was busy looking around at what people were doing and was trying to analyze what was happening. It also took me four PK Parties to get the PK experience. Later on in the evening at the first PK Party, the same 14-year-old boy bent the large steel rod very easily. The next day I bought the rest of the steel rods the same size from Sears. The head metallurgist at McDonnell Douglas in Huntington Beach, California attempted to bend one of the rods and finally did by straining and using his knee. He was more than twice the size of the young boy. The next month, I gave another PK Party. This time we used stainless steel flatware forks and spoons. (Knives sometimes break and could cut people.) I also added a number of experiments, including metal and plastic of various types. We put strips of thin metal in soda pop bottles and stuck them in corks securing the metal strips to the top of the bottles so people would not handle the strips. The strips continued to bend for three days after the party. A lot was learned using the PK Parties to create the PK environment while conducting experiments within the parties. It was discovered that people could buckle the bowls of silver plated spoons. They could not do that using their brute strength, but they often could using PK. So we started "High School bending," where people bent things that were beyond what could be done by physical strength alone. Steel and aluminum rods were cut to lengths that could not be bent physically. The rods and silver plated spoons are used in High School bending. "Graduate School bending" is when people are given two forks that have been checked and any bends removed. They hold a fork at the bottom of the handle in each hand. They simply command the fork to bend spontaneously. Sometimes one or both forks bend spontaneously. Any amount of spontaneous bending is significant and evidence of macro PK. At the time this paper was presented on March 28, 2003, I had given 361 PK Parties that were attended by approximately 17,000 people since January 1981. All of these parties have been documented. The date, location, number of attendees, and the number of people who had success in each of the phases of the PK Parties are kept in a computerized database. Similarly, from PK Party #44 through #343 attendees filled out questionnaires, recording their perception of what they did and that data has been recorded in another computerized database. 59% of the 14,315 people attending those PK Parties turned in completed questionnaires. Pictures of individuals, couples or families were taken at each PK Party and a copy given to the people in the pictures when possible. Occasionally it was not possible to correlate the face in the picture with the name and address of the individual. Figure 2 shows typical results during these phases of a PK Party. A typical happy Kindergarten bender is the woman shown in the top-left corner of Figure 2. People do use two hands in Kindergarten bending and are encouraged to feel for when the spoon or fork loses its structure (the grain boundaries of the stainless steel seem to melt allowing the grain boundaries to slip and the metal feels like rubber). Stainless flatware is used for Kindergarten bending because stainless steel has a very low thermal conductivity that translates to allowing the bender to have more time to find the window in time when the metal becomes soft. It stays soft between 5 and 30 seconds before it refreezes and returns to its solid state. When stainless flatware is stamped out at the time it is manufactured, dislocations are created along the grain boundaries in the flatware. These dislocations seem to act as transducers for the PK energy that turns to heat and melts the grain boundaries. Most stainless steel has a melting temperature of over 2000 degrees F. The actual grains in the stainless steel are not being melted, just the edges of the grains called grain boundaries. Thus the flatware is not hot to touch, but often people feel the warmth coming from within the metal. 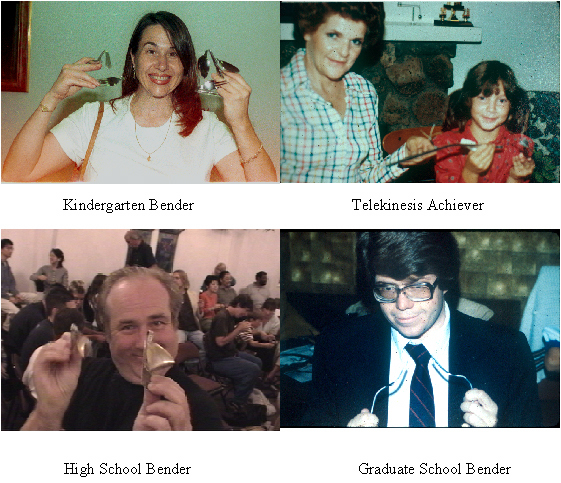 The overall success rate for people who try Kindergarten bending is 85%. A man who was able to buckle the bowls of two silver plated spoons is shown in the lower-left corner of Figure 2. Buckling the bowl of a silver plated spoon is considered High School level bending because the shell structure of a spoon bowl makes it very strong. Very few people have been able to buckle the bowl of a stainless spoon because stainless steel is so strong. However, most silver plated spoons are made from pot metal and then plated with silver. The pot metal is not as strong and buckling those bowls seems to be possible when using PK and some strength with both hands. Often people describe the bowl buckling as if the metal felt like paper and very easily was buckled, when they are distracted. Aluminum rods (one foot in length and 3/8" in diameter) are often available for bending in PK Parties. Also, zinc plated steel rods with diameters up to ¸" are often available.Ê When people bend these they have done something spectacular. The overall success rate for people who try High School bending is approximately 32%. A man who had both of the forks he was holding during Graduate School bend over spontaneously is shown in the lower-right corner of Figure 2. He was holding the bottom of the stainless flatware fork handles, one in each hand. He was concentrating on the fork in his right hand when I noticed that the fork in his left hand was bending over spontaneously (not using the other hand). I asked him if he saw the one in his left hand and then he looked at it and said "How did that happen?" At that moment, the fork in his right hand bent over spontaneously. This was another example of the PK working when he was distracted or let go. Young children seem to do spontaneous bending very well. The head of the fork may twist or the tines separate in different directions. Any amount of fork movement is considered very special and occurs for approximately 11% of the people who participate in the Graduate School phase of PK Parties. Occasionally, I notice something especially interesting at a PK Party. Onetime, I saw that the small girl shown in the upper-right hand corner of Figure 2 had bent a large steel rod. I went over to where she and her mother were sitting and patted her on her head telling her how great I thought she had done. Her mother then said, "Oh, she can do more than that." I asked "Like what?" The little girl turned and pointed to the tennis stick figure with a counter weight for balance on the mantle above the fireplace and said "Move." The figure then spun around on the point of the stand it was on. This is referred to telekinesis, or moving objects without touching them. I have not conducted experiments within the PK Party environment on telekinesis, but that would certainly be an interesting area for additional experimentation. One experiment that provides some insight into the PK effects was done with four old type hacksaw blades. Each blade was tested for its hardness with a Rockwell C hardness (Superficial 15N Scale) testing machine. All four measured very hard, although two of the blades were slightly softer than the other two. One of the blades was isolated from the other three by placing it in a separate home. From then on in the experiment, the separated blade was always tested at a different time than the other three blades so that they would never be together. The other three blades were placed in a brown paper bag and exposed at four PK Parties over a three month period. The bag was placed in the center of the circle of people involved in the PK Parties. Only my metallurgist and I knew the experiment was in progress. All the blades were tested the day before the next PK Party. This was done to allow any time effects to occur in the blades after they were exposed at a PK Party. The hardness of the three exposed blades all reduced from the original very hard steel of the hacksaw blades to near that of annealed steel, which is very soft. The control blade maintained its hardness throughout the experiment. The measured hardness of these hacksaw blades is shown in Figure 5 of Reference 3. In another experiment, a Hall Effect sensor was constructed with two Hall Effect chips placed back to back (in order to cancel any temperature effects) and the output run through a bridge circuit to the chart recorder which was located about 20 feet from the sensor. The sensor was also enclosed in a thermos bottle for temperature isolation. The sensor was on a stand, placing it about four feet off the floor. The sensor was aligned perpendicular to the earth's magnetic field lines in order to minimize the effect of the earth's magnetic field. A two minute cyclical signal occurred at the time the fork of a young girl, sitting within six feet of the Hall Effect sensor, had the top fall over resulting in a 90o spontaneous bend during the Graduate School phase of a PK Party. The data recorded on a pen chart recorder is shown in Figure 7 of Reference 3. The reason Hall Effect chips were chosen in the first place was not to measure the magnetic field, as is their normal application, but to see if the current through them is affected by PK modifying the dislocations in them by changing the mobility of electrons moving through the crystal. However, subsequent use of the same sensor produced no results.Ê The internal dislocations in any metal exposed to PK are changed, making this an unreliable sensor for feedback and training. During PK Parties, it was often noticed that when a zinc-coated steel rod is bent using PK, its shiny surface would turn black. Reference 4 is an analysis of this surface effect using optical and scanning electron microscopes. Reference 5 is a report on PK effects on clear plastic spoons and forks. It was noticed that children were able to bend clear plastic forks and spoons. Normally this material is very brittle and breaks when people try to bend it. The PKed area of the plastic looks cloudy to the naked eye. Under optical magnification, the cloudy area appears to have micro cracks emanating from a small bubble. It looks as if the spot of the bubble was heated causing that area to expand, creating the micro cracks. This effect seems to have some correlation to the heat being created along the grain boundaries in metal. The nice part about using clear plastic is that another feedback is provided to the person doing the PK in that they can observe the cloudiness as a signal for when the plastic is ready to bend. One of the most unusual examples of bending at a PK Party was caught on video tape in May 1986. A video clip of a man pulling apart a spoon is available in Reference 6. The event occurred at PK Party #140 held in Santa Fe, New Mexico. The party was being videotaped and the photographer happened to catch this man pulling apart the spoon handle he was holding. The next day at lunch, I sat down across the table from this man and asked if he would do it again. When he agreed, I went to the kitchen and bought a dozen stainless flatware forks. Returning to the table, I handed him one of the forks. He held it for awhile, concentrating on it. Then he pulled it apart! I took the other 11 forks back to the structures laboratory at work and pulled the 11 forks apart mechanically using a tensile testing machine. The average force to break the forks was 850 lbs. Over the years, I have collected data in formal and informal ways described here, and I have also gathered information through observation and anecdotal evidence. Typically there are 20 to 50 people at a PK Party. The success rate falls off when the PK Parties have fewer than 15 people. The largest party had over 400 people. Over 100 other people have given PK Parties all over the world. Everyone seems to be able to do PK. Metal often continues to bend for up to 3 days. The more dislocations in metal, the easier it is to PK. Cast metals are very hard to PK. Children bend clear plastic picnic spoons and forks easily. Graduate forks must be replaced after three PK Parties or they stop bending spontaneously. Approximately 50% of people who do PK at the parties are able to do it later by themselves. On occasion "critics" have written about PK Parties with a negative connotation suggesting the chaos with lots of people, commotion, and noise is covering up fraudulent behavior. The noise does have purpose, however. The first two steps for doing PK seems to be easy for most people. However, the third step (letting go) is something many people talk about, but few know how to do. The noise and the people shouting with joy help distract people causing them to let go and then they have PK success. It is true that magicians have tricks where they can with slight of hand or diversion appear to bend objects like those in PK Parties. The 17,000 people who have attended PK Parties cannot all be magicians. Seeing a six-year-old bend a ¸" diameter steel rod (18" long) about 20 degrees is very impressive. Healing Over these 22 years of giving PK Parties, I have noticed a number of events that would be considered spontaneous healing. For example, in the middle of a PK Party, a man would stand up and say that his back had just been healed. The PK "energy" seems to be magnified at PK Parties and is strongest at the center of the circle of benders. This seems to correlate well with the "chi energy" discussed in various martial arts disciplines. There are many alternative healing modalities that work with moving energy. Even though many of these techniques have complex process, viewing them simplistically, they generally can be boiled down to the same simple three steps used for PK. After all, if humans can affect material with intention, why not healing other humans? Researchers such as Dr. Larry Dossey, Dr. Yoshiaki Omura, and Dr. Daniel Benor presented scientifically collected data at the March Science of Whole Person Healing Conference. In conclusion, there is powerful evidence that mind matters and there is interaction between the Mind and the material world. Many questions remain, however, and much additional experimentation is required.